When most people think of visiting a theme park in Orlando on Christmas Day, Magic Kingdom is top of mind. However, Universal Orlando presents a great alternative on this festive day. 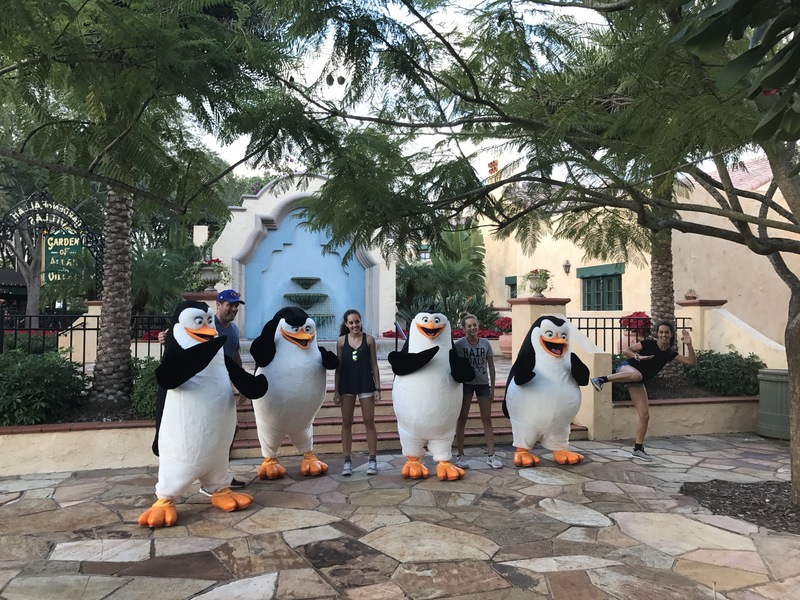 This year marks my second time visiting Universal Orlando on Christmas Day, and although I visited by myself, I had a great time. 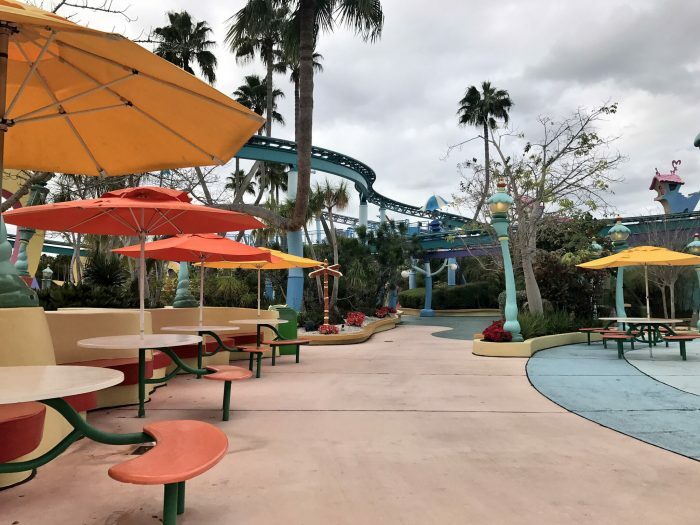 Here’s how I accomplished having an enjoyable visit and what I learned on this, one of the busiest days of the year in Orlando’s theme parks. 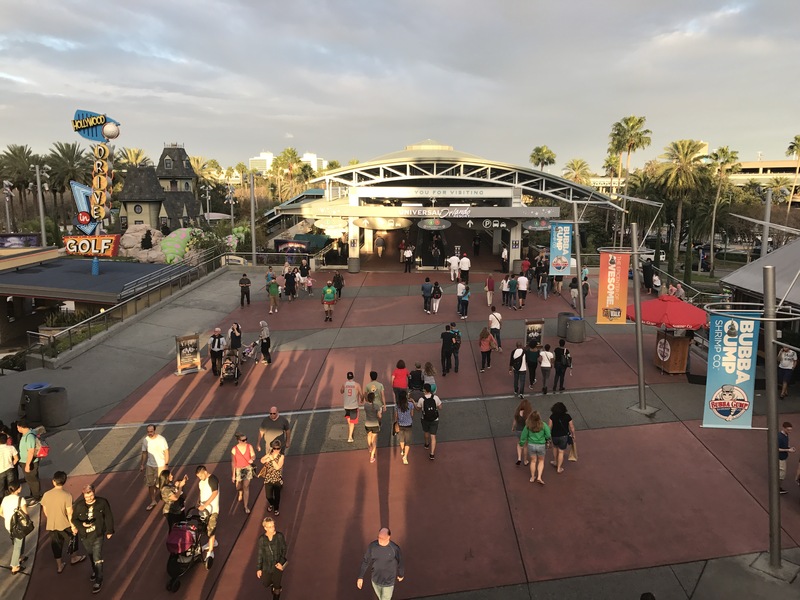 Last week in this Touring Plans blog post about Visiting Universal Orlando during the busiest weeks of the year I shared some tips that definitely came in handy. 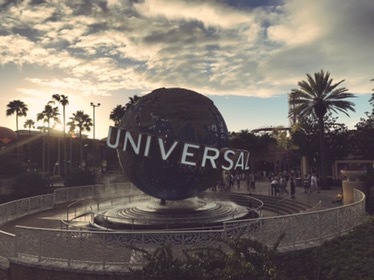 I had Christmas Day to myself and had set the day aside to visit Universal Orlando. 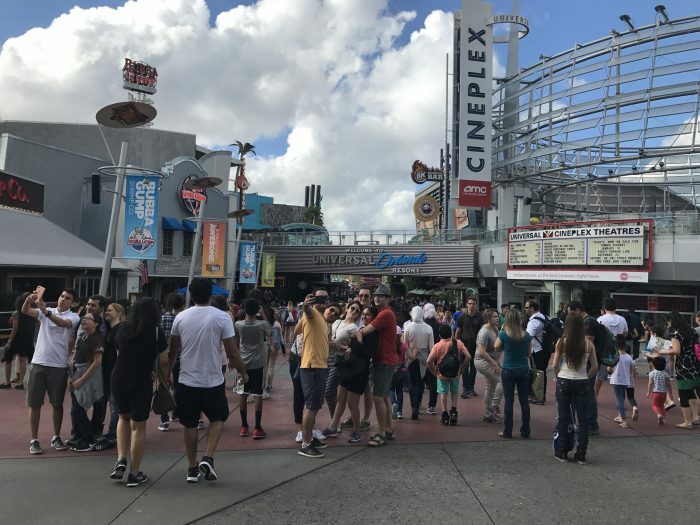 Now, it should be noted that the manner in which I visited Universal’s Islands of Adventure and Universal Studios Florida this day is a bit different than how the average guests would do. I was on my own. It didn’t matter to me if I rode anything. 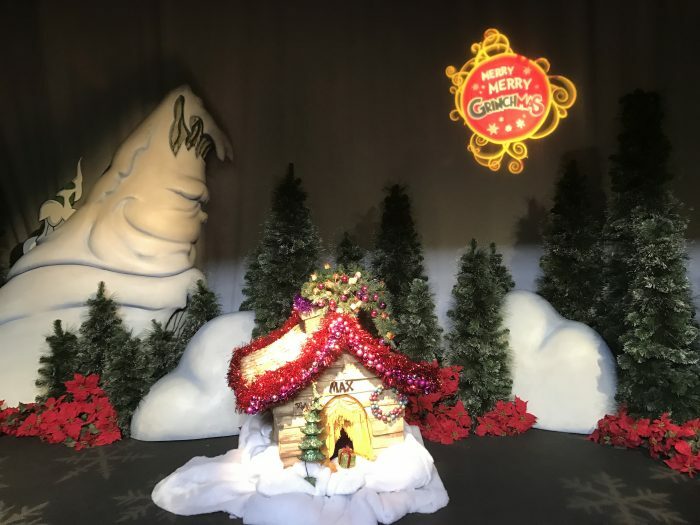 My purpose was to be in the atmosphere I love and be able to report on the crowd levels, wait times, and the overall experience of being inside Universal Orlando on Christmas Day. Arriving at any theme park sets the tone for the whole day. 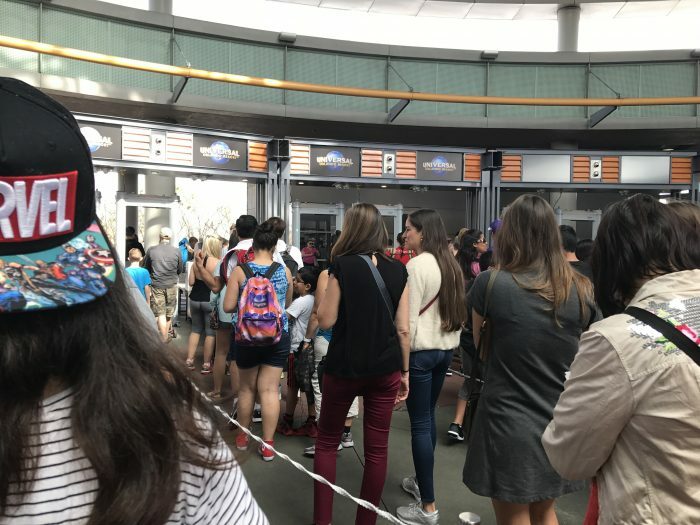 When visiting during a busy day like Christmas it is important to not let the long lines and crowds that you will surely encounter dampen your mood. I arrived around 11:00 AM. The parking toll was not backed up as I expected, but still very busy; I headed toward the left hand lanes which are typically shorter. 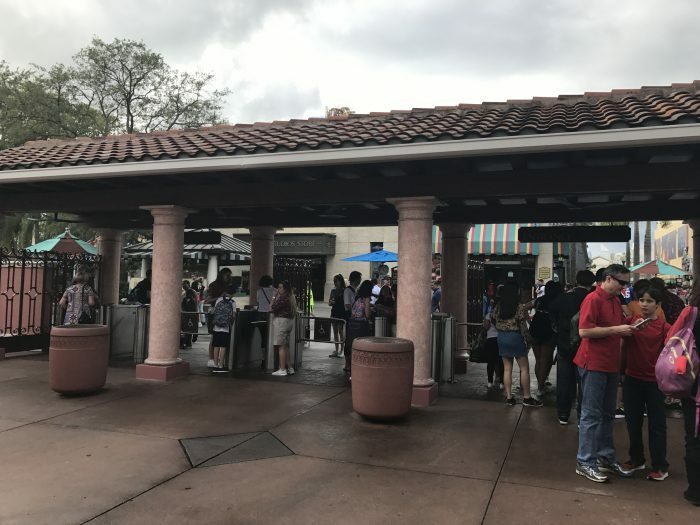 The security checkpoint at Universal Orlando can get very congested first thing in the morning and on busy days. Such was the case around 11:00 AM on Christmas Day morning. The real backup and congestion came not from waiting to go through the x-ray machines, but rather after passing through and waiting for your belongings to be handed off to you after they go through the machines. Family members wait in clusters making it difficult to exit this area. 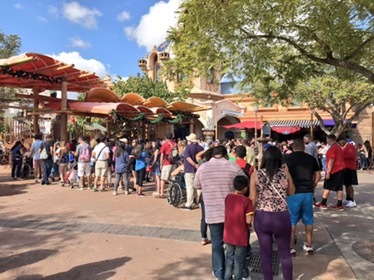 The third and final hurdle came when trying to get into Islands of Adventure. Lines everywhere! Lines for the ticket windows. Lines for purchasing Express Pass in order to avoid other lines. 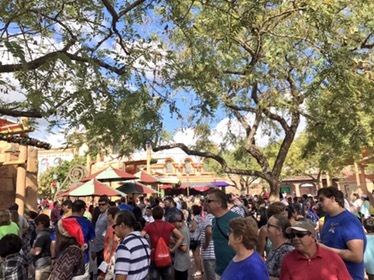 Lines at Guests Services. And of course lines to get through the turnstiles themselves. I’m just going to say it: Universal Orlando’s ticket taking system is so slow. Word on the street is an upgrade to this system is coming soon; I sure hope so! 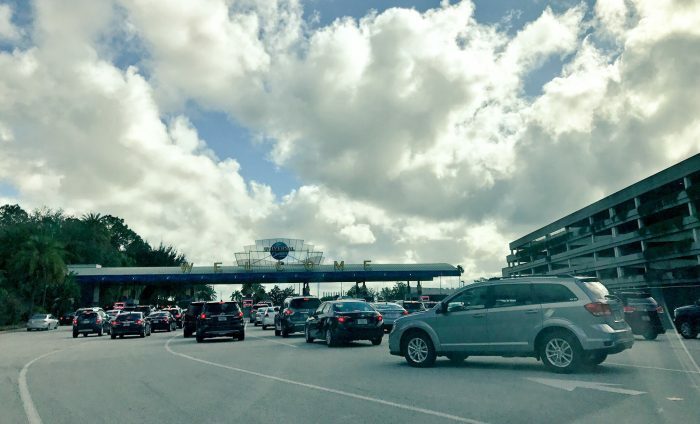 Extra tip: There is a “Side entrance” at Universal Studios Florida that can save you time and frustration when the regular entrance is congested. 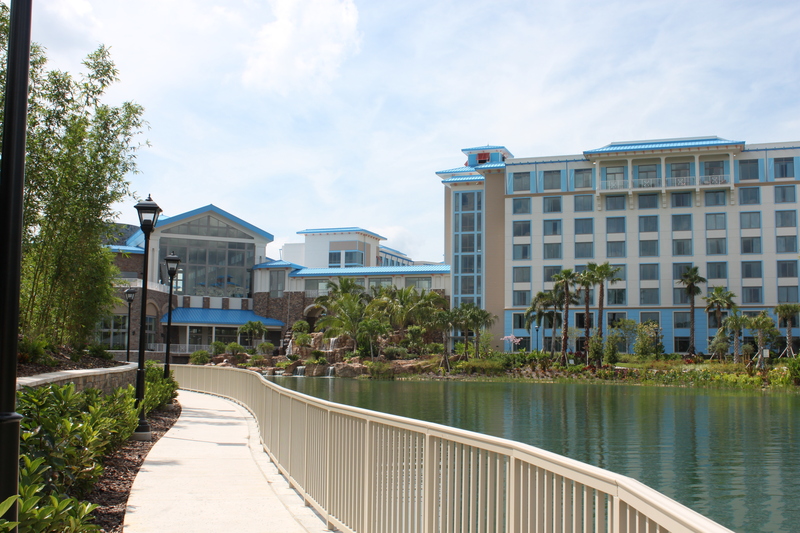 It is the pathway in between Hard Rock Cafe and the regular park entrance, it leads up to the Blue Man Group Theater. As you walk along the Blue Man Group pathway this side entrance to the park will be to the right of the Blue Man Theater. 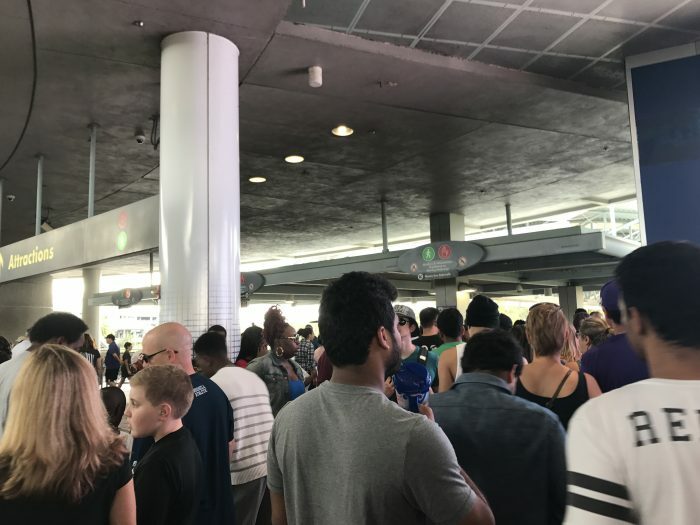 I arrived in late morning due to some chores at home, but also because I didn’t want to deal with the long lines at parking, security, and the turnstiles. 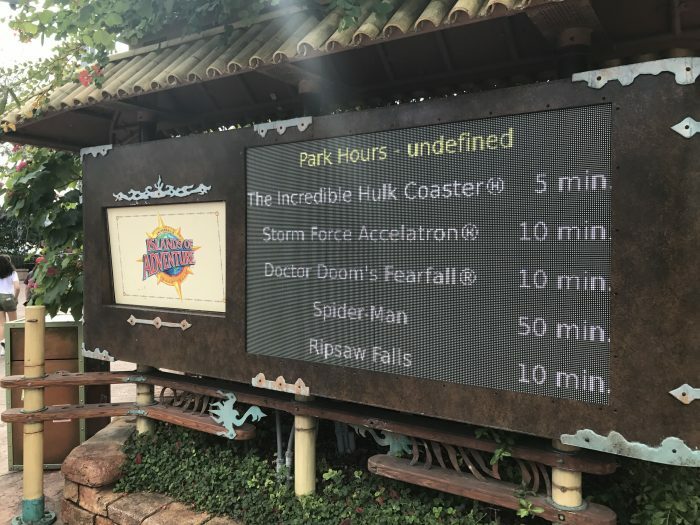 The trade off is I missed out on the glorious first hour or so of operation in which the wait times are at their lowest. Had I been traveling with friends or family I would’ve followed a custom Touring Plan and had everything in order to avoid long wait times. 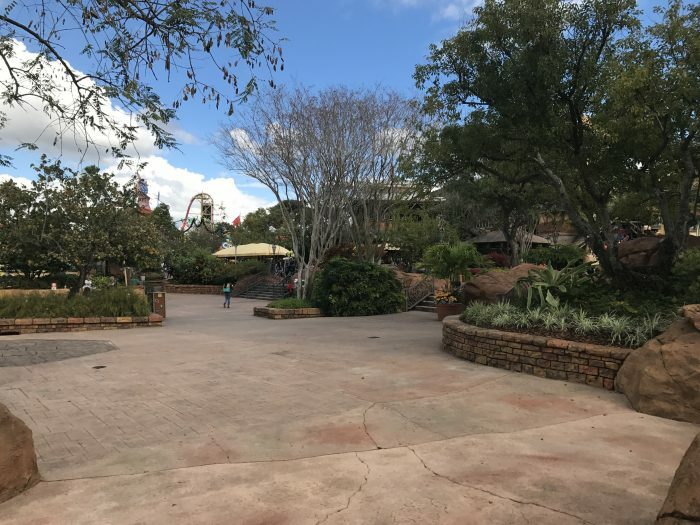 If you decide not to create your own touring plan, you may want to consider reviewing this list of rides with single rider lines. 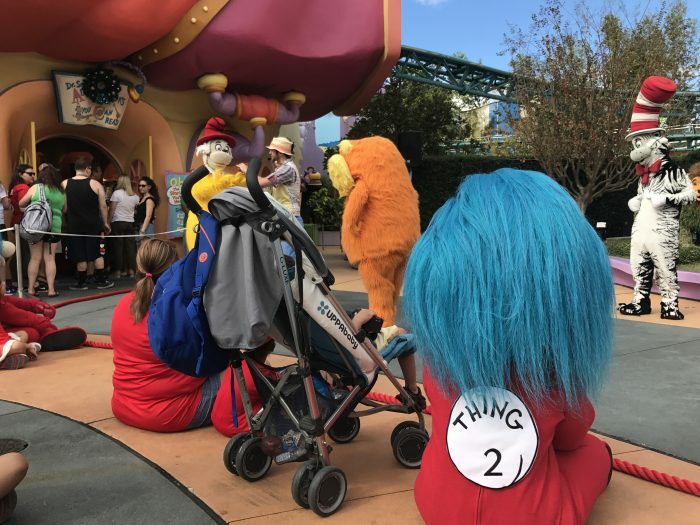 This method helps you enjoy shorter wait times at some attractions, though it does mean your travel party will not ride together. 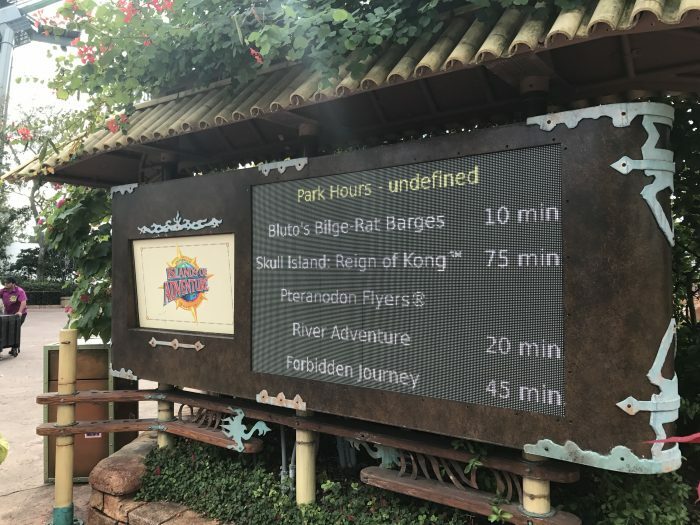 The wait times at 11:50 AM were not all that surprising, especially for Skull Island: Reign of Kong and Harry Potter and the Forbidden Journey. 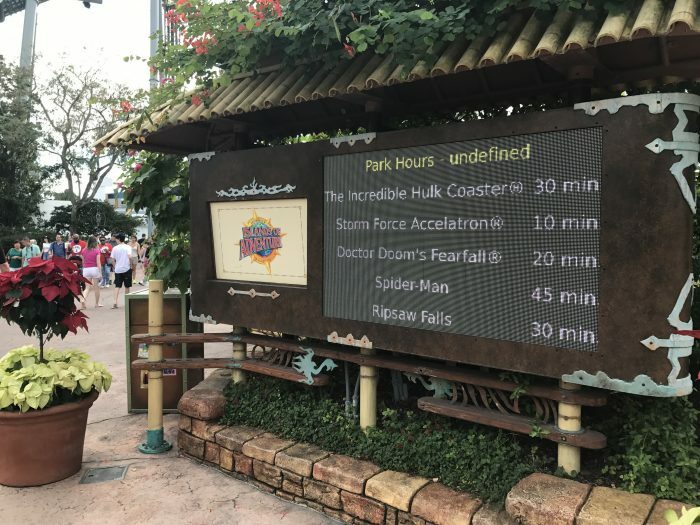 However, it came as a little bit of a surprise to see a 50 minute wait for the Amazing Adventures of SpiderMan and only a 5 minute wait for The Incredible Hulk Coaster. 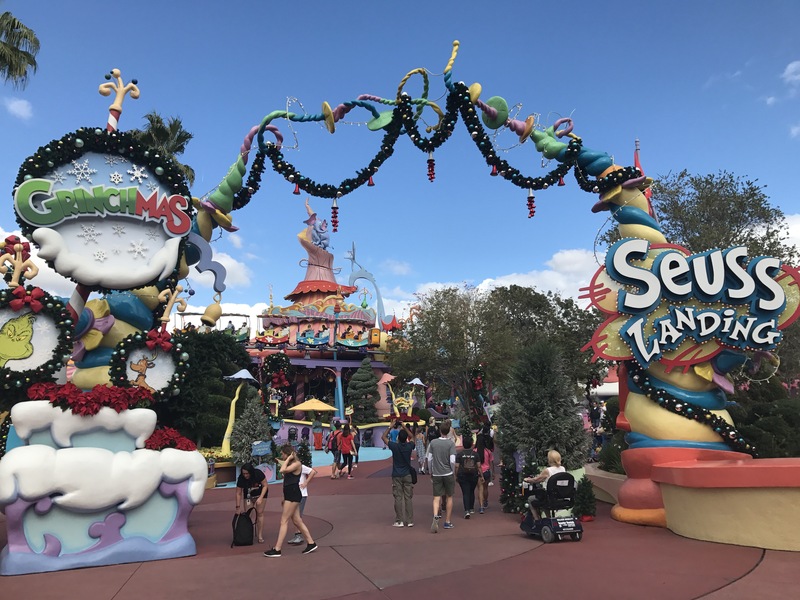 After observing the wait times I decided to head to Seuss Landing to enjoy all the decked out decorations and see what kind of fun I could have there. 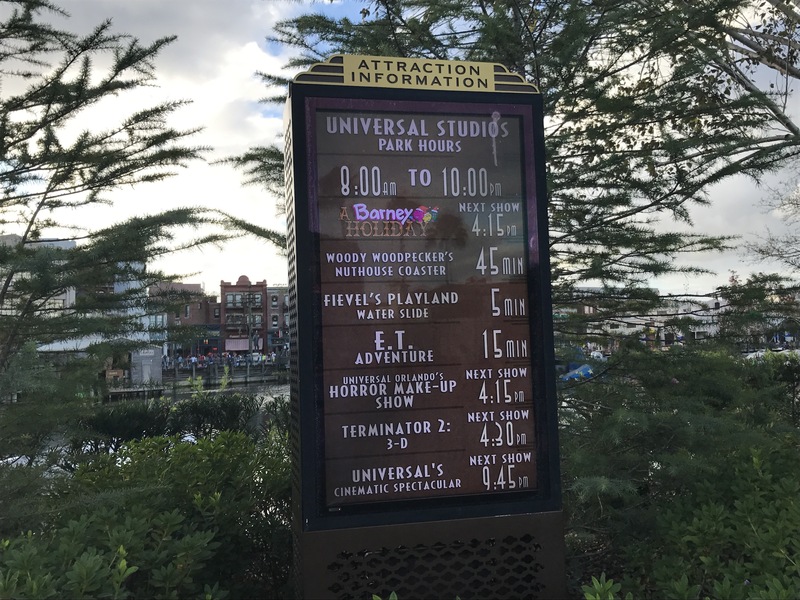 Two hours later the wait times increased for a few attractions, but stayed relatively the same for most everything. 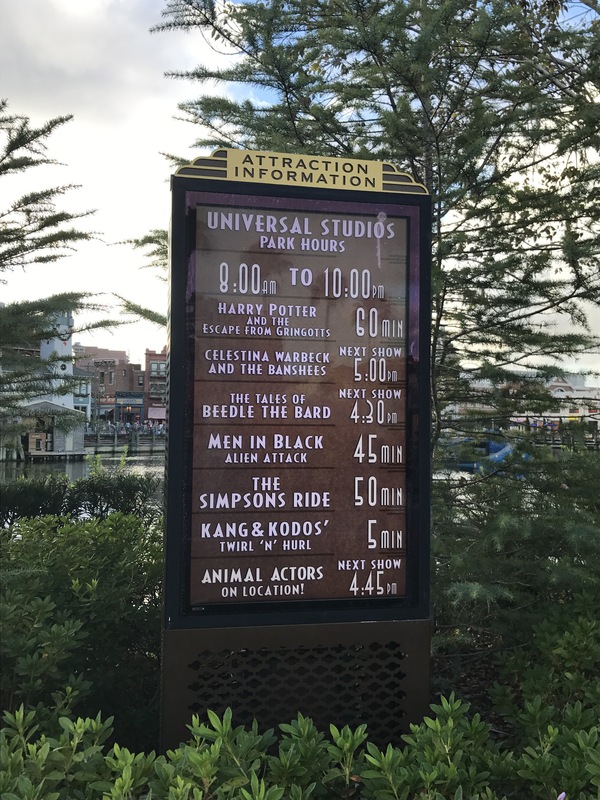 I visited Universal Studios later in the day and not surprisingly found the wait times for the most popular attractions to be very long as well, including 80 minutes for Minion Mayhem, 50 minutes for The Simpsons Ride, and 60 minutes for Escape from Gringotts. While the wait times may be a bit long on Christmas Day, and other such busy days, live shows are a great way to get some bang for your buck without having to endure a long wait. 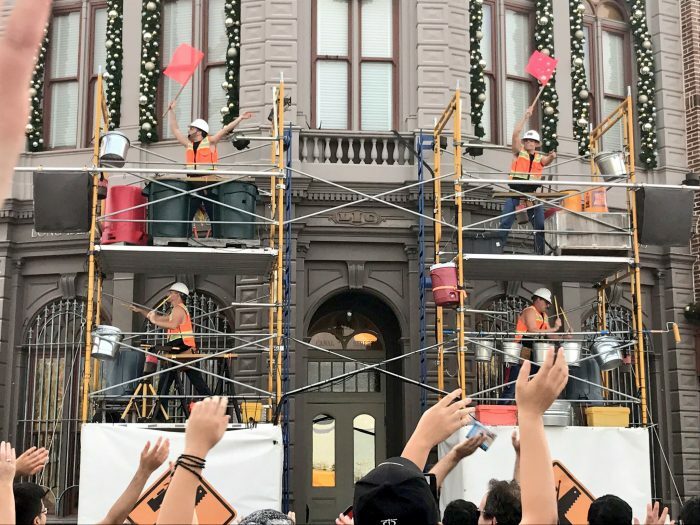 Many shows like the Blue Brothers Christmas Show and other live entertainment take place out in the streets meaning you won’t have to worry about it filling to capacity. 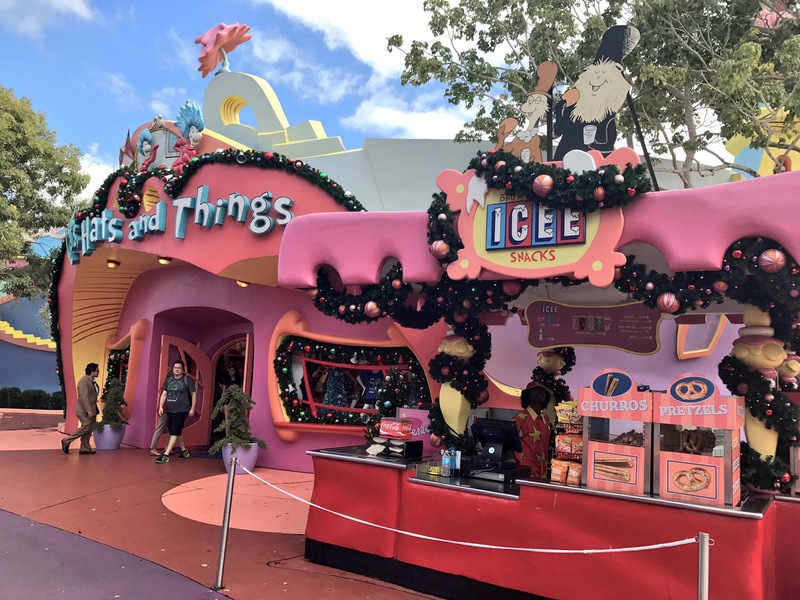 After strolling through Seuss Landing I caught the end of Oh the Stories You’ll Hear show which is moved to outside of the Circus McGurkus Cafe Stoopendous restaurant during Universal Holidays because of the Grinchmas show. 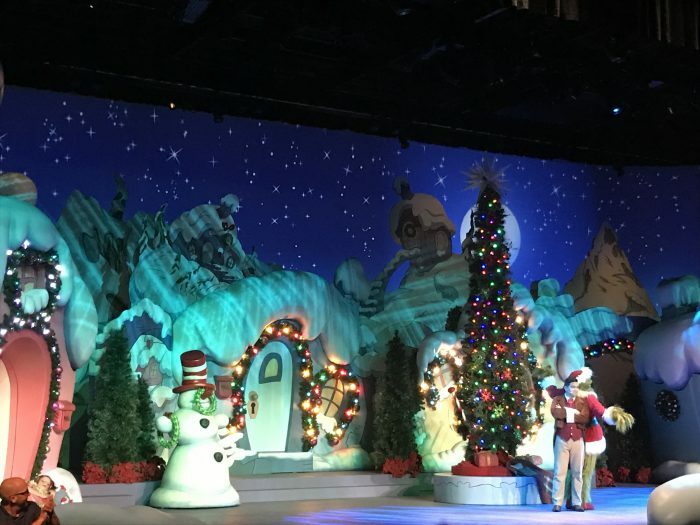 After the show I visited The Lorax for a quick meet and greet, then decided to see about catching a seat for the Grinchmas Who-liday Spectacular. I was surprised that even though I entered the soundstage with only five minutes left until the 12:45 PM showing, the theater was just over 50% full. 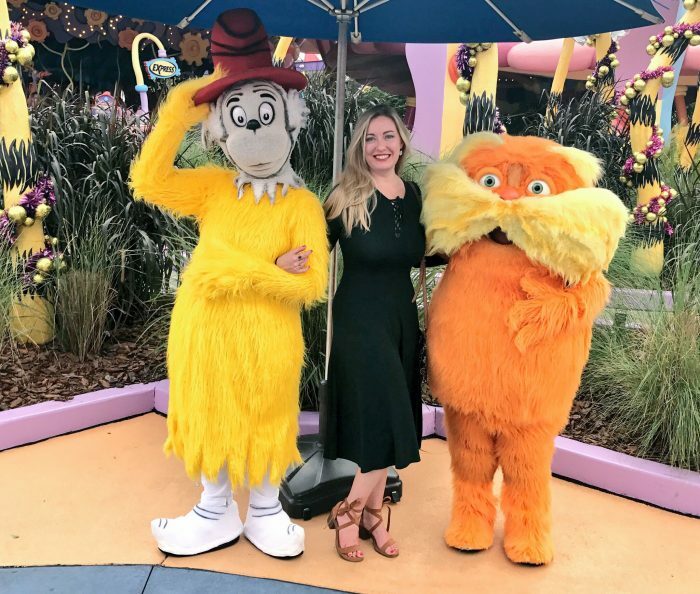 In both parks you can enjoy some great character meet and greet opportunities. 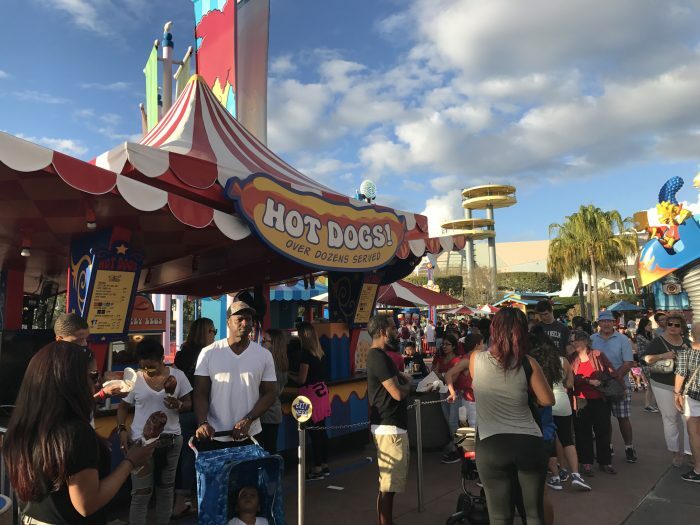 I have found Universal Studios Florida to have an upper hand on the amount of characters and the quality of meet and greet locations, especially in and around the Hollywood area. Around the holiday season you can expect to see a few more characters during the last two weeks of the year. Over in Studios I delighted in seeing Doc Brown out and about with the DeLorean very close to the park entrance when I entered around 3:00 PM. 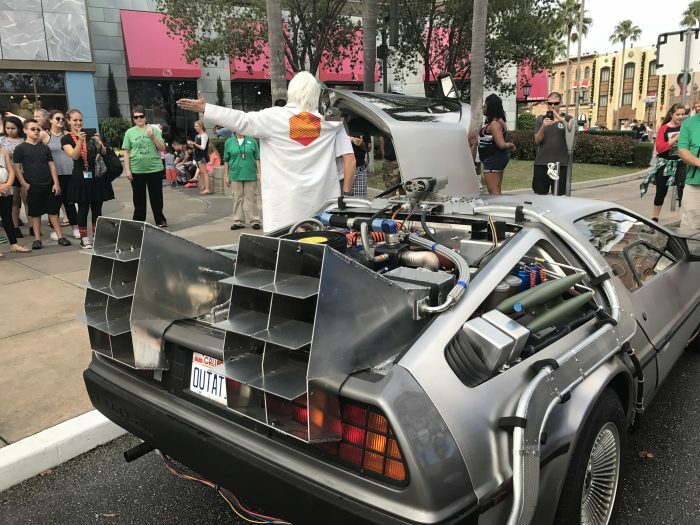 Later, about 4:00 PM I happened to cross paths with the DeLorean again as Doc drove it through the Hollywood area, past Transformers the Ride 3-D, and out through the gate near the upcoming Fast and Furious ride (he needed to get out of the way of the 5:00 PM Universal Superstar Parade). You can expect to see this enhanced meet and greet during the last two weeks of the year. Take advantage of these extra opportunities to interact with entertaining characters and get some great photos too! I think I’ve iterated enough that attraction wait times are long on busy days like Christmas Day, and the days immediately following. However, the wait times and lines for food at snack stands and counter service dining can be pretty intense. I opted to take a break and dine at Jimmy Buffett’s Margaritaville Cafe (more on that later). I suggest if you want to go with counter service dining that you do so in the 11:00 AM hour. After 12:00 PM the lines never really calm down. 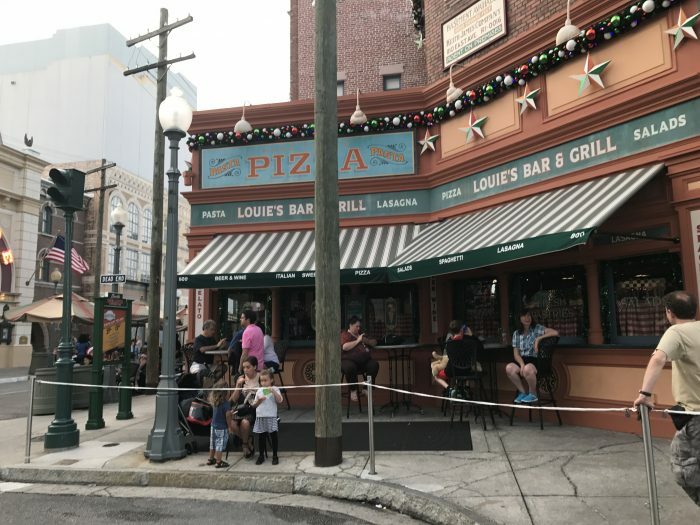 If you would prefer to relax and enjoy a table service dining experience then consider using the very easy online Universal dining reservations, especially for the restaurants inside the parks. It’s important to take a few breaks throughout your day, especially on busy days like Christmas. If you look around and get off the beaten path you can find spots with barely any other people around. If you see a path off to the side, go down it. As long as it is not marked restricted or “team members only” you will most likely find a new place to relax. 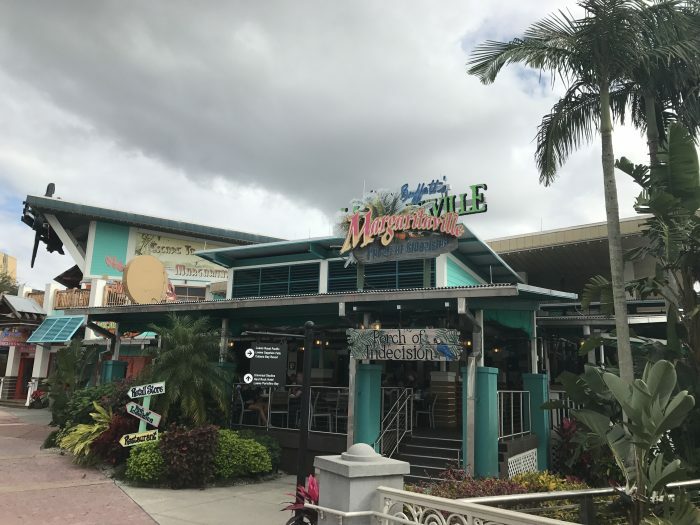 Since I did not have to worry about the parks closing up due to capacity I decided to take a break at Universal CityWalk with a visit to Jimmy Buffett’s Margaritaville Cafe. 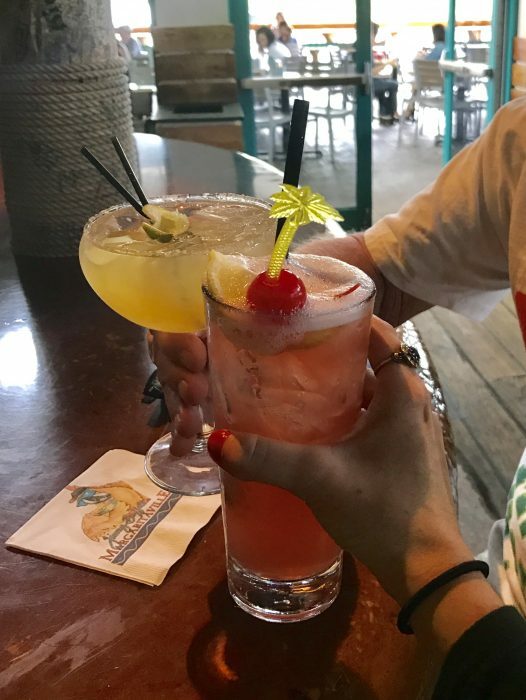 Christmas Day is actually Jimmy Buffett’s birthday so I couldn’t resist the chance to raise a glass and toast the occasion, especially when my friend Chuck was already there! We sat at the Volcano Bar, plenty of seating available at nearly 2:00 PM. I wanted some cranberry flavor due to Christmas so I went with the Incommunicado $10.50 – cheers! Turns out a little rain shower quickly washed over Universal Orlando while I relaxed inside Margaritaville. Talk about great timing! And when I entered Universal Studios around 3:00 PM I didn’t have to brave any crowds at the entrance! 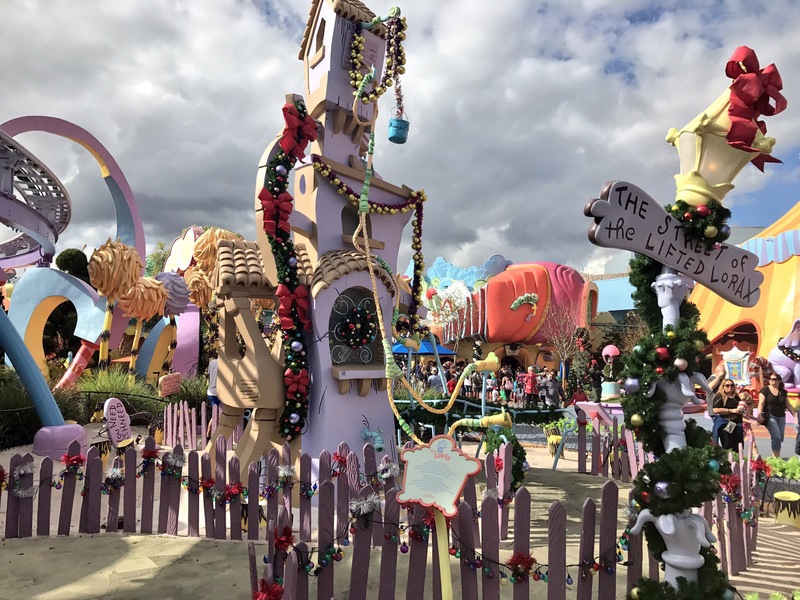 I honestly forgot that during the week of Christmas and New Year’s the two parades at Universal Studios are later in the day. The Universal Superstar Parade steps off at 5:00 PM. 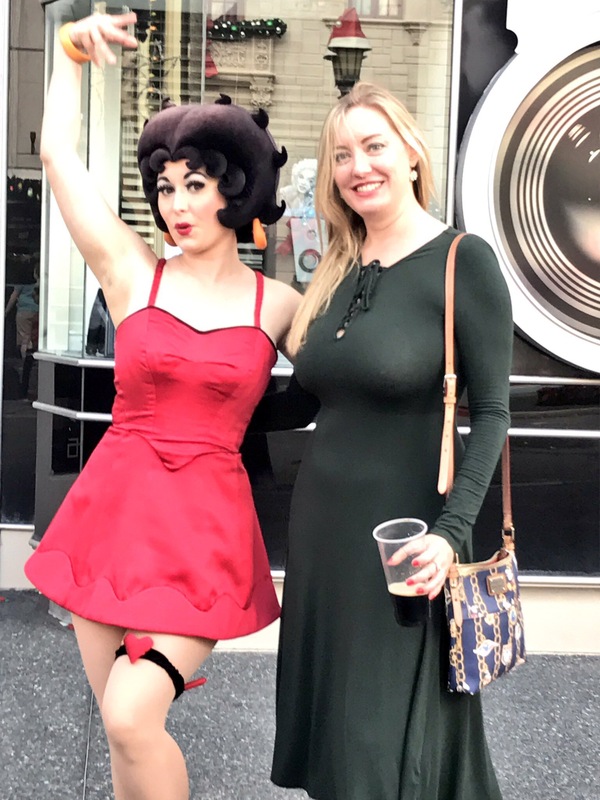 I happened to be strolling through the New York area 10 minutes before the parade was to step off in the Hollywood area. Front row spots were hard to come by, however, the parade route was only one row of people deep, making it very easy for anyone to stand behind this first row and still have a good view. 4:50 PM on 12/25/2016 One of the few places along the parade route to have plenty of room – Louie’s Pizza in NY area. The Macy’s Holiday Parade is at 8:00 PM during these last few days of the year. 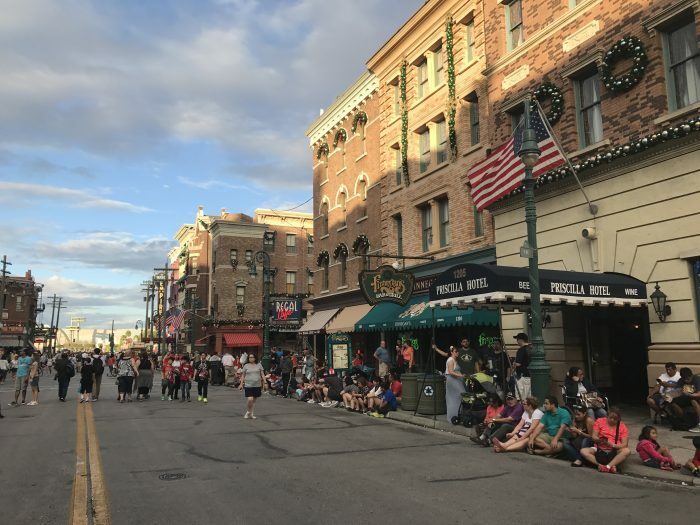 I was unable to stay in the park that late, but I can say without a doubt that this parade is more popular than the Superstar Parade so you’ll need to secure a spot no less than 30 – 45 minutes before the parade starts in Hollywood area. Christmas Day itself is indeed a very busy day. However, the days that immediately follow can actually be a bit worse. Make sure you have a plan, but also be ready to be flexible and take advantage of opportunities as they arise. Keep an eye out for unexpected character experiences. Go ahead and take a break, there’s plenty of calm areas if you look for them and get off the beaten path. Plan ahead for dining and don’t wait until you’re famished to find some food. 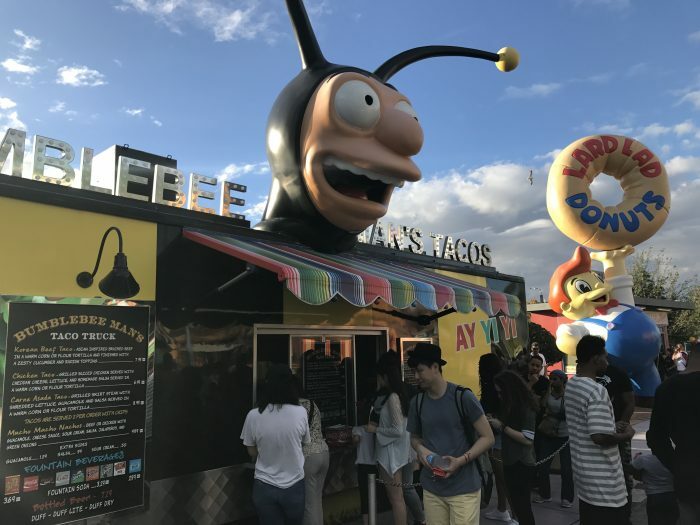 Enjoy live entertainment, don’t just focus on the rides. Although I was on my own, I enjoyed soaking up the atmosphere and going at my own pace. When you’re with friends or family it may seem more difficult to do the same, but if you consciously make an effort to relax and enjoy yourself your visit during this busy time will be worth it. If you’re visting during this time of the year right now, or if you’re planning for next year I hope my experience has helped you plan for your own visit. Great dress, Dani! You always manage to rock your in-park photos.